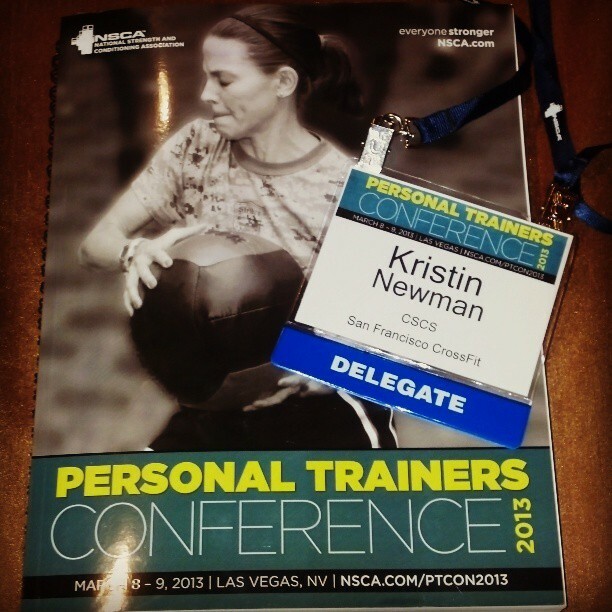 I just spent the last weekend, also my birthday, in Las Vegas to attend the NSCA's Trainer's Conference on Friday and Saturday. I'm still suffering from some information overload. There is still a lot of debate around low carb dieting for athletes. Listening to the Volek and Aragon debate, it would seem to be that the biggest variation is in what sort of sport you participate in, and at what level. You can't deny that carbs have hormonal effects beyond their calorie content. What neither speaker talked about is using that hormonal influence through intake timing to their advantage. Something I think is essential for highly competitive athletes. Battle ropes - I’ve never felt my lower lats burn like that before and I can’t wait to acquire some for my shoulder rehab. Should you train your clients like athletes? Babe Ruth wasn’t exactly hot, so maybe focus on skills training doesn’t have a place. Mark Nutting demonstrated the ease that participating in new social media platform, Vine, where you post looping 6 second videos. In understanding motivation, you have to understand that most people have forces outside the gym that are actively trying to discourage their improvements. They need to feel like they have autonomy and are getting things right, even when you are “making” them do work and teaching them something new. As a corrolary, people love time progressed feedback. The more tracking strategies you have (strength, weight, circumference, time to distance, etc) for them to feel good about, the better. Also, particularly on the second day, I heard a decent amount of scoffing towards, jabs at, and snide remarks about CrossFit. I love the methodology of CrossFit. I love that it gives many people the chance to feel like an athlete, and even compete as one, where they may never have had the opportunity before. I recognize many of the failings (low level of entry to coaching, little to no oversight from HQ about safety, unchecked egos, etc), there are many gyms that are fantastic and get great results from their members. In one lecture, I was one of two people who coached at a CrossFit facility. And herein lies the problem as I see it. Many in the CrossFit world have no interest in going outside that world to gain knowledge, expand their understanding, and bounce ideas off practitioners of other methodologies. Those inside CrossFit see those outside CrossFit as “others” who “just don’t get us” and lag behind as they cling to their outdated ways. Those outside the CrossFit world, who have been raise up either in personal training arenas or athletics, see CrossFit and those involved as ignorant or proper methods, closed minded to new information, testosterone driven, and immature. CrossFit, to them, is like that teenage boy who is going to drive too fast without a seatbelt because, dammit, no one is going to tell him what to do. There are so few of us who cross those boundries that one side will never get to know the other. The animosity will continue. I don’t think CrossFit is going to go away anytime soon.